This is our fifth year to participate in a Do Something Lenten Campaign. 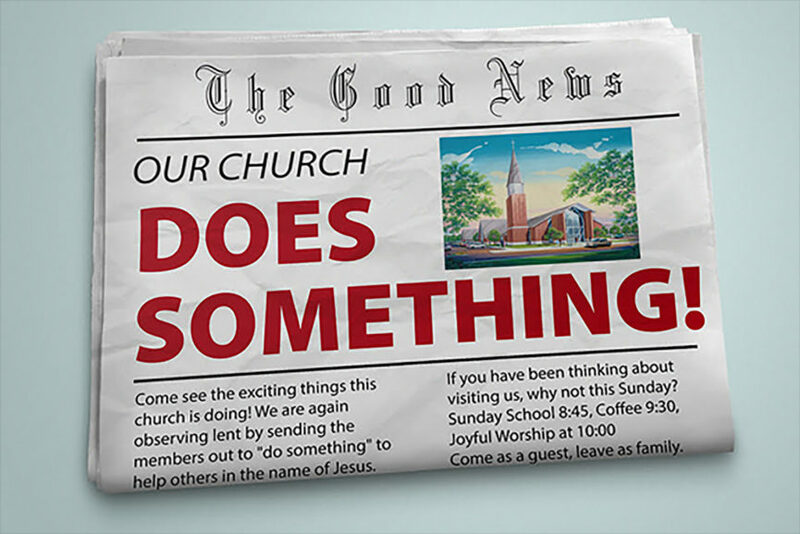 This year our theme is Our Church Does Something. Missions gives each person who participates $200 to use to help someone and spread God’s love. Many participants add or use their own money, too. The results are amazing. One person used her own money ($500.00) to have a handrail built on the little white house that our church owns – where Santhia lives. This person also donated to India Literacy and Evangelism, and to a scholarship fund to Baker University. One family has matched the funds and used it for Bridges Thrifty Boutique to replace the storefront sign that has been damaged due to wear and tear. Another family had a friend pass away last week. They needed help with funeral expenses. They used their own funds of $200.00. One person helped to pay for a premature baby’s surgery. One member is donating $200 to Straight Street Ministries. This is a Christ based residence in Cedar Hill for low-risk, recently released prisoners who are trying to restart their lives. Straight Street has operated almost invisibly for nearly 30 years and has successfully helped several hundred men get back on the right path with Christ as their guide. Nearly all of their offenses were as drug users. They attend church every Sunday, and nights in between. They also must have jobs and contribute to their upkeep. So they hold jobs and are productive all around Cedar Hill. Another person gave to a foundation called Hero Labradors. This is an organization in Decatur, Texas that breeds and selects Labrador Retrievers for service dog training. They are provided free to training programs who then donate them to veterans and first responders. This organization was founded by a retired Army soldier, Chuck Ziegenfuss, who was wounded in 2005 by a roadside bomb in Iraq. Every year someone uses the $200.00 as a starting point to deliver books to students at Cesar Chavez Elementary School in Dallas. These are books students get to take home. This year she got donations from Half Price Books and the court where she works to donate over 900 books. One member matched the church money and gave $400 to Larry Hodges, head of the Cedar Hill Youth Football association. They will be using the donation to help kids purchase equipment (shoulder pads, mouth guards, etc.) who otherwise would not be able to obtain. She is also going to volunteer at Dallas Life, a homeless shelter. One couple gave $50 to the USO which provides support for our military. They also gave $50 to the Special Olympics of Texas. And they gave $100.00 in support of a young couple who have a one year old son. They were recently in a car accident and the mom lost her arm and is still hospitalized for her injuries. The dad also suffered serious injuries and has been out of work. The funds are slated to help offset the cost of a prosthetic arm and other expenses. This family also needs our prayers. One member gave $100.00 of her own money to support Clover Community School – a private nonprofit for special needs children. Another person gave $100.00 to Wheeler Mission Ministries, which helps feed the homeless and the other $100.00 to our bell choir. and Easter basket supplies for Youth World – a Christian organization in South Dallas that provides summer camps and after school programs for underprivileged children.